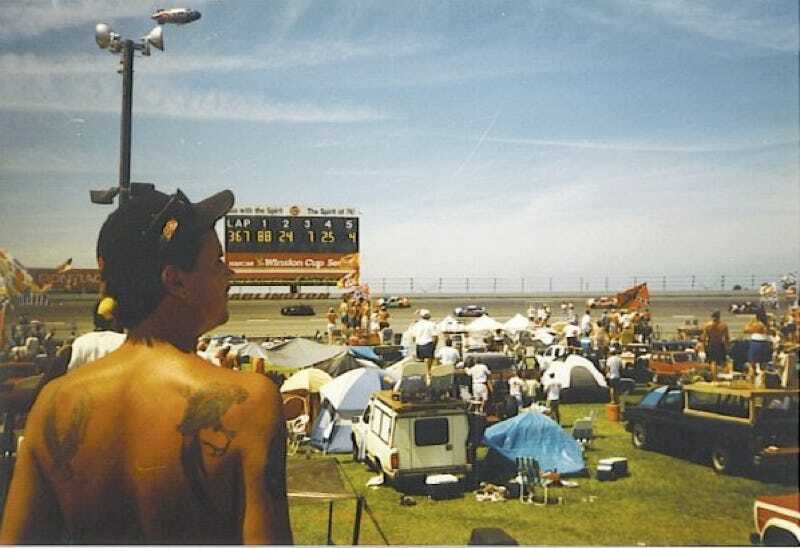 On Aug. 31, 1996, I drove my Toyota Corolla onto the infield of Darlington Raceway. It was an import, driven by a guy from the North, but I done didn't care. From all accounts, the Southern 500 was a grand time in the Pee Dee region of South Carolina. All accounts were correct. That guy in the picture, I don't remember his name, but he was there with his wife and newborn. Don't remember their names, either. But I know everybody except the baby drank Crown Royal overnight till the bottles ran dry and the passing went out. Some of it got drunk on the platform he'd built atop his pickup. Some of it got drank on the Corolla roof that still bears indents from that glorious day. The rest is foggy. Very foggy. And that was the night before the race. Even though Jeff Gordon won, it remains a glorious memory. (Particularly, the people standing at the pit-row fence begging for crew members to give them used tires. Memorabilia? Home furnishings? For use? What did they want the tires for?!) All of which is to say I don't write NASCAR events off as hillbilly, muck-wallowing jamborees, even though I haven't been back, nor will I likely return, to a race. Darlington depended on those two races a year to keep its middlin' economy going. It became less a sporting event and more a cultural affair, even at the Thunderbird Inn right where Lucas Street meets the I-95 overpass. It was a regional necessity, which makes the NASCAR corporatization that stripped Darlington clean of its second race all the more bothersome. My point? Don't really have one, I guess, other than wanting to share a vignette from what I consider the closest thing I've ever seen to Americana encapsulated in a Stars and Bars encampment. Enjoy the race, if you're so inclined to watch.